When I say that I can write nothing but weird fiction, I am not trying to exalt that medium but am merely confessing my own weakness. The reason I can’t write other kinds is not that I don’t value & respect them, but merely that my slender set of endowments does not enable me to extract a compellingly acute personal sense of interest & drama from the natural phenomena of life. I know that these natural phenomena are more important & significant than the special & tenuous moods which so absorb me, & that an art based on them is greater than any which fantasy could evoke—but I’m simply not big enough to react to them in the sensitive way necessary for artistic response & literary use. Lovecraft’s use of the term ‘weird fiction’ is not in a generic sense, but actually refers to a genre-of-sorts. Weird Fiction is akin to a sort of a ghost story/horror/macabre vibe separate from what we call fantasy or sci-fi, and was used from the late 1800’s to roughly the 1930’s, before these niches were labeled. This entry was posted in Writing and tagged H.P. 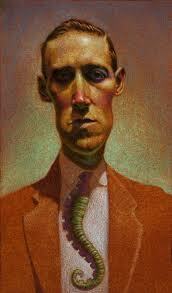 Lovecraft, Quote, Weird Fiction. Bookmark the permalink.